FCI UP Watchman Result 2018: Food Corporation of India Uttar Pradesh has conducted the written test for the post of the watchman on 30th September. This examination was conducted offline in many examination centers. Aspirants seeking to get jobs in FCI have competed for the written test round on this Sunday, 30th Sep. Hopefuls waiting to check the FCI UP Watchman Question paper solutions can download from FCI UP Official website, fciupjobs.com. The answer key/question paper solutions will be accessible within 3 to 4 days after the exam date. Aspirants competed can stay checking the official portal to download the FCI UP Watchman result. Also, here are the updates regarding the FCI UP Watchman merit list and cutoff marks. Food Corporation of India Uttar Pradesh has advertised 408 watchman posts in 2017 and invited applications from eligible aspirants. Many of the hopefuls seeking to get FCI vacancies have applied for the watchman posts. Candidates will be shortlisted based on their performance in written test, physical fitness, and interview rounds. Candidates initially have to qualify the FCI written test to proceed for next rounds of selection process. Candidates have to qualify in various rounds to finally get shortlisted for the posts of security guard/watchman. Final selected candidates will get good pay scale as per norms. The FCI is expected to announce the watchman results within 1 month, approximately. Hopefuls can get ready to check the result. 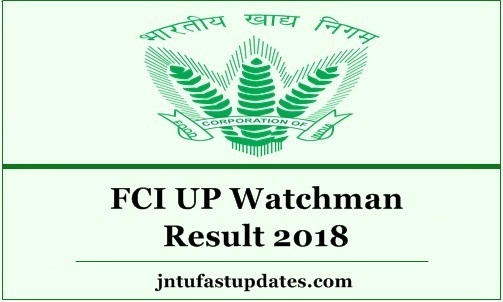 Candidates who have appeared for the FCI Watchman screening test can check the Uttar Pradesh Watchman Cutoff marks 2018 at the time of result announcement. Candidates scoring the minimum cutoff marks are said to be qualified in the test. Candidates who have cleared the examination will be sent for the interview round. The Uttar Pradesh FCI will announce the Uttar Pradesh FCI Watchman Merit list 2018 with the names of candidates cleared the examination. Competitors have to wait till the FCI announces the result, cutoff marks, and merit list. The FCI likely to release the Watchman results, Cutoff Marks, and merit List 2018 in last week of October (tentatively). Visit the FCI Official website, Fciupjobs.com to check the latest updates from the board. Result of Written Examination Test is now available in your login, Please check your login. Download FCI Watchman Results and take a print out of it. Fci up ki cut off kab aayagi.